Eek, I've missed my Monday flower deadline. In fact, I haven't even started SEWING it together. I'm behind, yes I know. However, all the finished quilts - real quilts -that I've posted about should make it okay. I know I've only posted two of them but I have another one that just needs it's binding attached and then it will be ready. I'll be at the Lake all weekend so either A) I will get all caught up and then some on the flowers or B) I won't do anything sewing related which means I'll be even further behind. I'm pretty much okay with either option. My cousin Marci is getting married in June. Family weddings give my mom and I an excuse to get together and make a quilt so we decided early this year that we better get planning. Marci met with my mom to see a sample of some previous quilts. She decided she likes squares and she wanted lots of white with a little bit of purple. We worked together to make and piece the blocks and borders. I quilted it and my mom did the binding. In the borders, I quilted Marci and Nick and June 4, 2011. Here's a close up of the quilting. Most of the quilt is an overall stipple. We gave the quilt to Marci during her wedding shower this weekend. She LOVES it and it received a good amount of oh's and ah's. Yay! It will go in her living room which is painted purple. She painted the other rooms in her house lime green and mustard yellow. A girl after my own heart! I made this quilt in 2009 and posted about it on my other blog. (This was before I separated my quilting blog from my family blog.) But I never had a picture of it finished. It currently resides with my mom who loves all that is pink. When I was at her house this weekend, we took pictures of several finished quilts. iPhone photos aren't the best -- I'm definitely missing my camera. 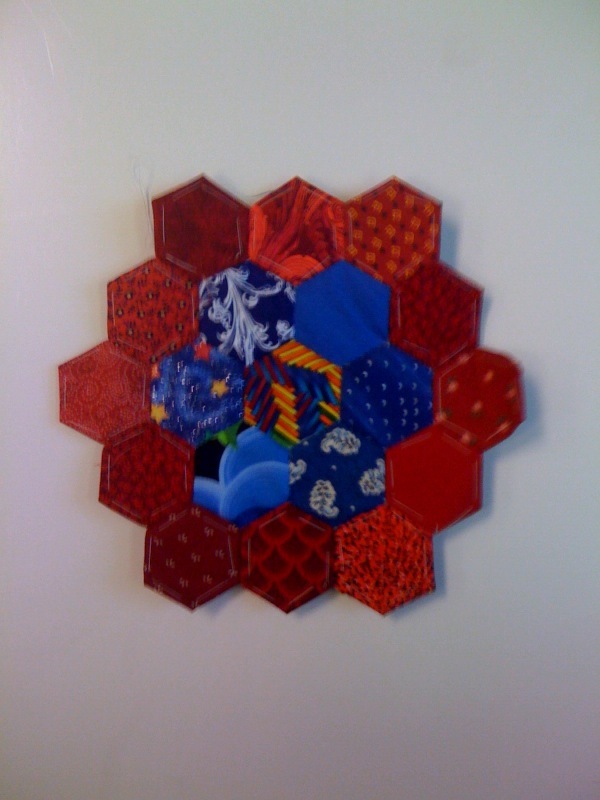 Here's my latest Grandmother's Flower Garden quilt block. I apologize for the background of my kitchen table. It's a bit distracting, I know. I'm trying a new quilting technique. Unfortunately, it's not going well. I'll tell the tale when I finish it up. I need to stay positive!! I finished Alaina the Intern's quilt Thursday, washed it Friday, and wrapped it up in time to bring it to her graduation party on Saturday. I always work best under pressure! I think I mentioned that I received a gorgeous pack of animal print fabric from a colleague as a thank you for speaking to her fundraising class. Alaina had taken her class a previous semester so she tagged a long to give her input. Alaina loved the fabric so I immediately decided to make her a quilt with it. It was the perfect set up. Unfortunately, I'm still without camera which means I only had my phone to take these photos. I had hoped for a sunny day for natural lighting but the rain prevented it. Please excuse the blurry, out of focus photos. I will regret not having a good photo of this quilt. I machine stitched the binding for this quilt - a new technique for me. I had viewed a couple of tutorials and I think it turned out really well. At least the blurry photo will convince you of the same. Jay McCarroll fabric! I love loved Jay in Project Runway so I bought a few cuts of his fabric when it was on the discount shelf of Shiisa Quilts. I haven't had a project to use his Garden Friends in Rust fabric until now. My dryer hasn't been working very well lately (camera, dryer, see a pattern here?) so I washed and dried it at the local laundromat. I loved watching it spin! I made Alaina open her present before I left her party. I wanted to see her reaction. She knew I was making the quilt but had no idea what it was going to look like. She loved it and insisted we show it off to everyone else who was there. I forgot to mention that the pattern is Gumdrops from Blue Underground Studios. I wanted the blocks a bit bigger than what's called for so I cut 3 inch strips instead of 2.5 inch. I've done some flowers that I don't like at all. But this one I love. I've decided that when I put this together, I'm not going to add the green outline - the garden. Instead, I'm going to mix the ugly flowers in between the pretty ones and call my quilt, Grandma Needs to Weed Her Garden. That's the plan for now anyway.